You know what sounds fun? A Scatterplot competition! I know it’s not exactly a sequel to the epic Mario Kart races of 2009, but it might still be fun. This time it is a guessing game. 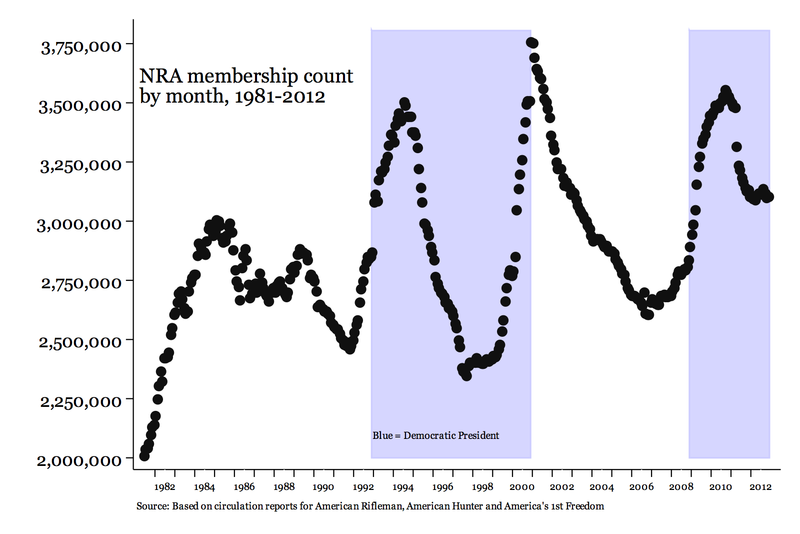 How many members will the NRA have in June of 2013? Place you guess along with a brief description of your methodology (if you used any) in the comments. If you modeled this instead of just taking a guess, it would be great at some point to get a write up of what you did so others, including me, can learn. You are allowed up to three guesses, but only your final one counts. If you do this really well, my guess is that you could turn it into a publication. I would be that the NRA had about 3.1 million members at the end of 2012. That is up from 2.7 million members in 2007, but down from about 3.5 million in 2010. Since then, the NRA claims to have added 100,000 members between the Newton, CT shooting and January 10th, 2013, and then another 400,000 more by end of January. According to the NRA, this adds up to 4.5 million active members, but I’m suspicious because their claims are unverifiable and they have no incentive to tell the truth. My stats are based on the number of reported subscribers to the NRA’s three magazines—American Hunter, American Rifleman [sic], and America’s 1st Freedom. Almost all NRA memberships come with your choice of one of those three magazines, so the total number of subscribers is a pretty good estimate of their total membership. While they don’t sell these magazines on newsstands, this still isn’t a perfect measure. It might underestimate because the NRA sometimes offers $10 memberships that don’t come with a magazine or you could elect not to receive any print magazine. It might overestimate membership because members have the option to pay an extra $10 and receive a second magazine. Based on two minutes in gun forums, I’m convinced that these sources of error are probably quite small and likely cancel each other out. Glenn Kessler at the Washington Post has an article on the validity of using subscription data as a proxy for NRA membership. Using subscribers as a proxy for membership was originally discussed in Mother Jones. In that article, I’m an anonymous “source.” How glamorous! For the purposes of this competition, I’m counting the total number of subscribers of the three NRA magazines as the number of NRA members. There are probably three main ways to create a prediction. The first route would be to make an informed guess. Second, would be to look at it like a day trader and estimate six months out based on historical month-to-month shifts. This sort of time-series analysis is uncommon in sociology and made trickier by all the ups and downs. The third route would be the more standard sociological method of finding a bunch of monthly covariates that are likely to be correlated with membership and trying to predict based on those. But go wild. * A couple of adjustments are made to the raw figures. I interpolated the first two years of America’s 1st Freedom, when it was called American Guardian, because I only had annual data. Also, the reports in the last half of 2004 seemed to be missing 220,000 people, so I added them back in. I’m also missing data on Women’s Outlook. It was published for only three years in the2000s, and I don’t think it was that popular because it was shut down so quickly and because its circulation was never submitted to the major audit bureau. If you are a Junior member, your $15 gets you a copy of NRA InSights. About 25,000 kids get this, and I’m not counting them because I don’t have any historical data on that subscription. Hmmm. The data seem to show mobilizations or subscription drives organized around or influenced by electoral cycles followed by periods of decay as joiners don’t renew. I rather imagine that many organizations with a lobbying component would show similar cycles. I assume that if multiple people give the same answer, the one who gives it first wins. Because after someone else has accurately predicted it, it’s not really the future anymore. Advocacy group exaggerates. In other news, the sky is (Carolina?) blue. My brief experience in looking at the gun debates is that any numerical data invoked by either side needs to be taken with a grain of salt. That Mother Jones invokes Josh Sugarmann is telling since he has long been one of the biggest contributors to what Glassner calls “The Culture of Fear” around guns. As someone who thinks the facts matter, this is frustrating to me. It is appropriate, though, that this post is filed under “sports,” since guessing the NRA’s membership has the character of sport. Exposing that the NRA exaggerates its membership numbers is not not going to have any more political effect than poking holes in studies that show “people who keep guns in homes are almost 3 times more likely to be murdered” (Brady Campaign). It’s sad but true. For different ways in which the facts don’t matter in the gun debates, see Kahan and Braman’s “Caught in the Crossfire: A Defense of the Cultural Theory of Gun-Risk Perceptions” in the UPenn Law Review (2003), based on Mary Douglas’s work. Or Kahneman and Tversky from the perspective of cognitive psychology. Does the winner also get a ribbon for ASA? Hmmm…I’m going with a perfect 3,000,000.
ow: Pretty strong electoral patterns. Growth was highest in 2000, followed by 1993 and 2009. I don’t know know the 2000 story (the threat of AL Gore? ), but losing a Presidential elections seems to net them a half million members (except post Clinton reelection, when they were flat. Perhaps they were unable to recover from the 1994 Assault Weapon Ban). I made a graph showing membership growth across different periods in the electoral calendar. mike3550: Ribbons! How could I forget about them. Of course! I used Rob Hyndman’s forecast package for R to create this quick forecast. I estimated two models: an exponential smoothing model and an ARIMA model. The ARIMA model produces a more conservative estimate with a narrower confidence interval than the exponential smoothing model. Here is a gist of my code. Plot of the complete time series with forecast. Plot of only 2009-2013. 1) I only use January 2000 onward. 2) I split the adjustments proportionately for each magazine and add them to the magazines’ counts. 3) I’m guessing that maybe the subscriptions appeal to different types of NRA members. This guess would suggest that their ARIMA processes would differ. I use auto.arima() for each magazine’s adjusted subscription count and add the mean June forecasts together. For those looking for possible correlates, Mother Jones has compiled a list of mass shootings that is available in a variety of formats. Yo – when is Neal going to be added to the masthead? Tangential but . . . However many there are, how many of them strongly support the current leadership? I heard Bill Bradley on the radio yesterday suggesting that it would be more effective to fight the NRA on its own turf rather than in the legislatures. Get the old-style NRA (hunters) to run against the current 2nd Amendment absolutists. Based on choice of magazines, hunters are a shrinking proportion of the NRA’s membership. Subscriptions to American Hunter are at their lowest since 1981, even though they have a million more members today than they did then. In the mid 1980s, a majority of NRA members picked American Hunter. Today, it is less than 30%. Jay – Tangential but very interesting (to me at least). I think there are actually (at least) two divides among the NRAs actual and potential constituents to consider. As you note, you have your old school hunters (what the new school folks derisively or humorously call “Fudds” after the inept hunter Elmer of Looney Tunes fame). They’re like the Dana Carvey character “Grumpy Old Man” on SNL – they like things the way they used to be. So some are susceptible to the Bradley strategy, which is already being used by groups like the CSGV (if you watch their Twitter feed @csgv). And then you have those who took over the NRA in 1977 seeking a more expansive understanding of 2A rights (your “absolutists”). These folks will no more budge in their views than the Josh Sugarmann’s, Brady Campaigners, etc. will. But then you have a third group — “Gun Culture 2.0.” These people come into gun ownership and use not through hunting, law enforcement, military, or other family traditions, but through concern for self-defense (including concealed carry), shooting sports, and even video games like Call of Duty. They tend to be younger, more racially diverse, more female. And at least until recently, they have tended to be less political. So, these could be another group of people that could be recruited against the NRA. Judging from on-line forums, many of them don’t love Wayne LaPierre’s style. His blaming of video games for problems of actual gun violence was a big turn off for many — especially since there is no evidence that any of the high profile murderers of 2012 were heavily influenced by video games. Another possibility, however, is that they will be recruited to the NRAs cause if the NRA can convince them that people want to take away the guns and accessories they own. Being drawn into gun culture through self-defense, shooting sports (including recreational target shooting), and video games, AR-15 style rifles and 20-30 round magazines are at the very heart of many of these people’s involvement with guns. And it does not require any exaggeration on the part of the NRA to convince them that people in fact do what to take away these guns and accessories from them. A warning to those who think you can mine a good monthly predictor from Google correlates. You probably can’t. Their data only goes back a couple of years, so it only catches the post 2008 increase and decline. That inverted U shape matches quite closely the lifecycle of many products, so is highly unlikely to be predictive going forward. I highly doubt the NRA is as dead as the netbook, for example. Google trends, however, might give some hints about the extent to which membership grew post Newton. I’m on the edge of my seat here! Me too. Still waiting for the circulation reports.